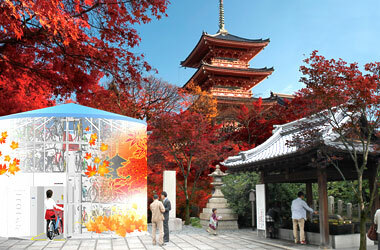 MOBILE ECO Cycle | GIKEN LTD. Currently, bicycles are gathering attention as a cutting-edge means of transportation in terms of ecology, CO2 reduction, clean energy, and healthy lifestyles. 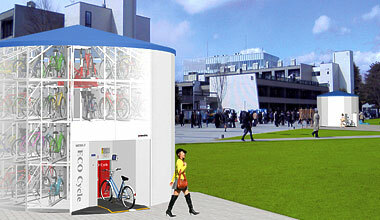 MOBILE ECO Cycle is an innovative movable bicycle parking system. 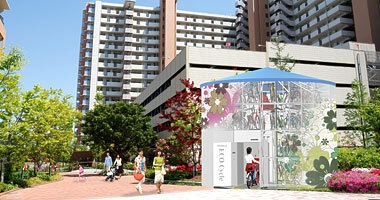 Mobile ECO Cycle maximizes convenience and ease of use in urban areas. 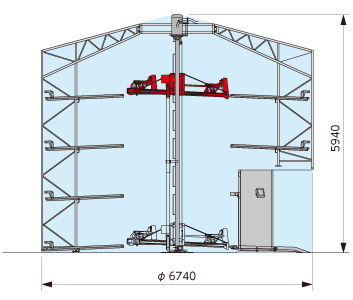 It can quickly be installed and removed in narrow areas. 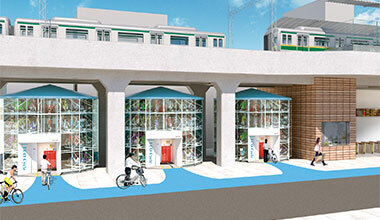 Since our first launch of the automated underground bicycle parking system “ECO Cycle” in 1998, we have refined and advanced bicycle storage technology. 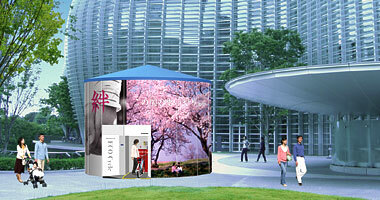 We applied this experience to Mobile ECO Cycle, which is easy to operate, ecologically friendly and economically sound. 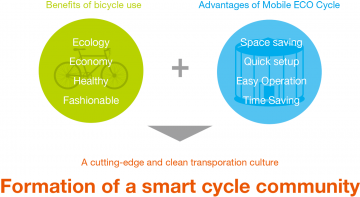 By linking benefits of bicycle use with the advantages of MOBILE ECO Cycle, we enable creating a smart cycle community – a cutting-edge clean transportation culture where bicycles can be used “anytime”, “anywhere” and “easily”. Because of its simple kit assembly, it can be quickly set up following basic procedures. 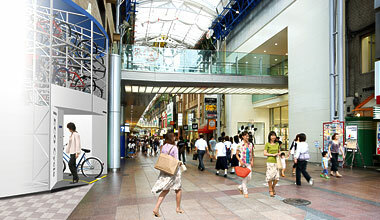 Setup work can be completed in one to two days and removal work can be completed in one day. 2. 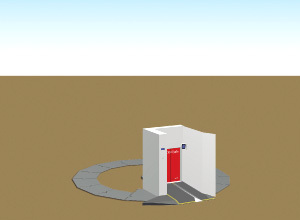 Base, entrance booth setup. 3. Frame parts assembly and machinery equipment setup. 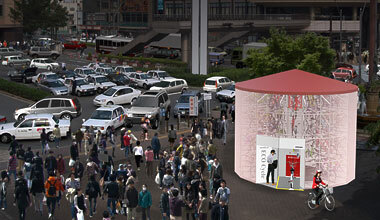 Mobile ECO Cycle can store 58 bicycles within a 6.74m diameter by 5.94m high space. 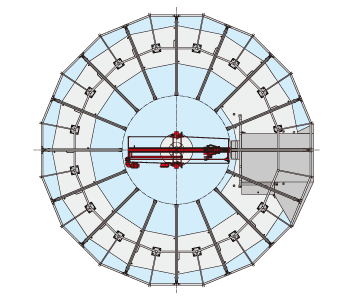 Therefore, it is suited for use in confined spaces. 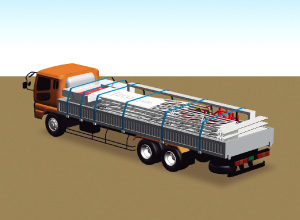 Both the drop-off and retrieval operation of Mobile ECO Cycle are very fast and easy. IC Card and IC Tag systems are used for convenience and it takes only an average of 9.7 seconds per operation. Cyclists can feel assured that their property is protected from weather elements and theft. 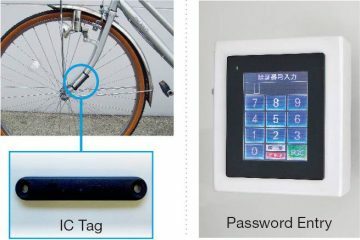 With the standard specification, users are registered using IC Card and IC Tag. This makes bicycle registration, drop-off and retrieval, a simple procedure. Electric password access is an available option on request. 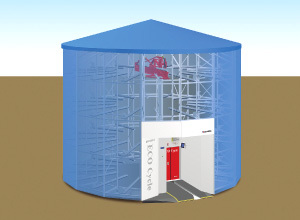 Managing staff responsibility is limited to customer registration, thanks to the fully automated Mobile ECO Cycle. Therefore, workforce can be kept to an efficient minimum. Due to this, Mobile ECO Cycle costs are much lower than traditional bicycle storage facilities. Cyclists have a personal connection to the Mobile ECO Cycle. 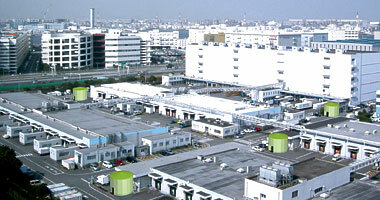 Users both trust and memorize the location and appearance of the facility storing their belongings. 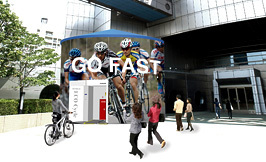 They will associate their property with any advertisement displayed on the Mobile ECO Cycle. 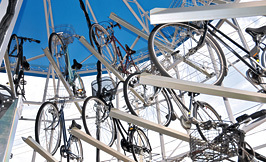 Setting up near mass transportation hubs such as train stations and bus stops to encourage bicycle use as an ingress/egress transport mode that connects travelers to their next destination. Mobile ECO Cycle’s exterior can double as advertising space. 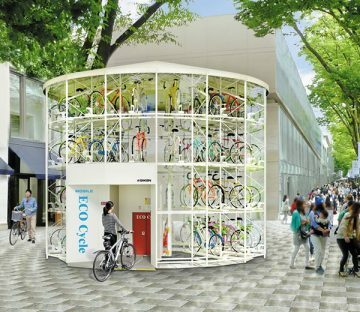 Any practical unused urban space can conveniently be utilised by setting up Mobile ECO Cycles. 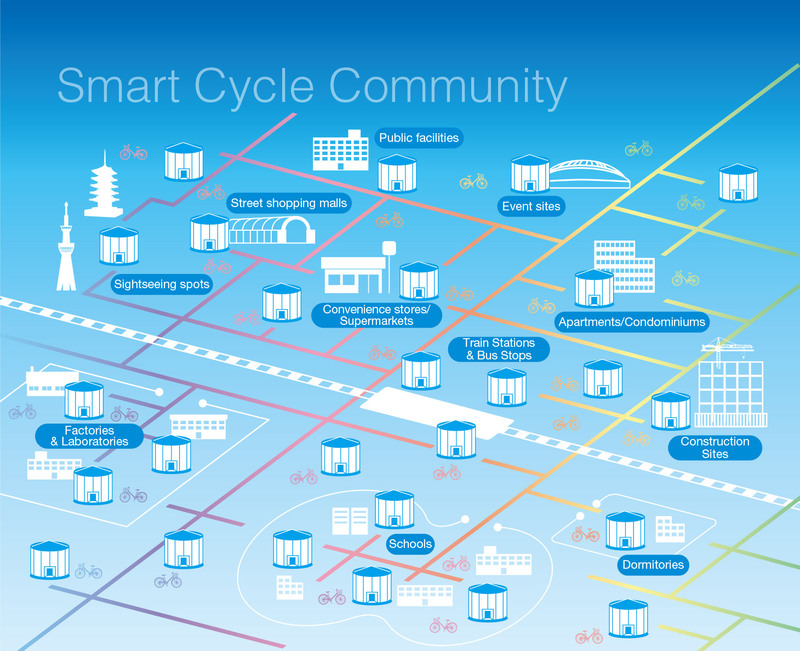 Mobile ECO Cycles can form a network of cycle sharing ports that allows tourists to conveniently access local landmarks without being a distraction. 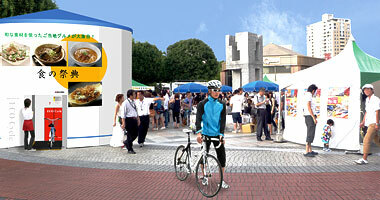 Mobile ECO Cycle perfectly suits short-term events. 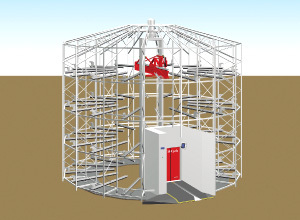 Requiring only a single truck for transport, Mobile ECO Cycle can be installed within two days and dismantled within a day. By promoting bicycle use, Mobile ECO Cycle directly impacts community health, economy and environment. Mobile ECO Cycle aids with clearing obstructing bicycles in high density areas, resulting in happy cyclists, pedestrians and store owners. Mobile ECO Cycles are perfect for schools and campuses as students and faculty are among the most prevalent cyclists in our communities. 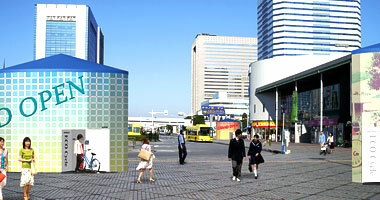 Public facilities, such as city halls, libraries and museums are often not equipped with adequate parking. 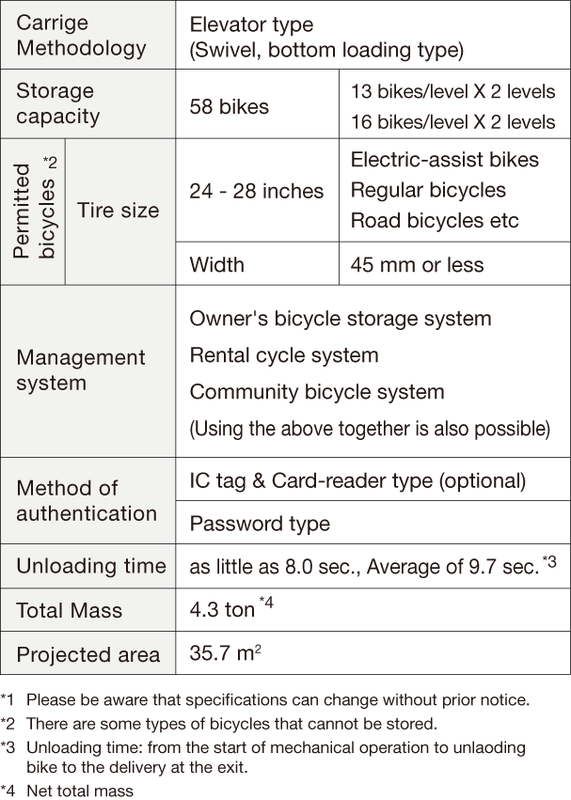 Property value can be increased by adding MOBILE ECO Cycle, which can conveniently store trending bicycles such as electric power-assist, high-end and ride-sharing bicycles. Traveling short distances across company premises by car can be incredibly inefficient. Mobile ECO Cycle allows staff to remain focused on their tasks. Creating extensive temporary parking zones can be very expensive and difficult logistically. 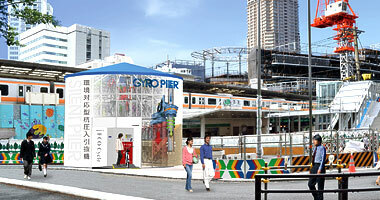 Mobile ECO Cycle can be strategically deployed when space and budget are constrained. Distribution of food, water and basic supplies to disaster victims is greatly hindered by the disruption of existing transportation networks. Mobile ECO Cycle can provide a lifeline to both people in need and those trying to help.